Small 0.75" (19 mm) Dia. The LC302 Series is only 3/4" (19mm) in diameter and fits in the smallest places. Its high 0.5% accuracy and small package solve many industrial force measurement applications. All stainless steel construction and high quality strain gage assures long term reliability in industrial environments. The LC302 is also available in metric configurations, with ranges from 0-100 to 0-5,000 N. Please see the LCM302 for complete details, or contact our Pressure department for more information. 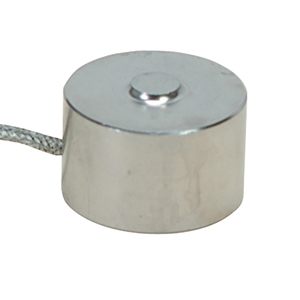 Compression Load Cell 0-25 lb. Compression Load Cell 0-50 lb. Compression Load Cell 0-100 lb. Compression Load Cell 0-250 lb. Compression Load Cell 0-500 lb. Compression Load Cell 0-1000 lb. Note: All LC302 Series load cells include a 5 point NIST traceable calibration certificate.